Andrew and Brianna Pavlak in Griswold. Brianna and Andrew Pavlak go grocery shopping on weeknights when there are fewer shoppers because Andrew, a National Guard veteran, gets nervous in crowds. They love taking their two dogs to parks, but avoid busy weekends. “It’s not the dogs, it’s the people,” Andrew said, who suffers from Post Traumatic Stress Disorder (PTSD). Andrew, now 28, came home to Griswold in 2007 after a Humvee rollover accident left him with traumatic brain injury, PTSD, depression and back problems. Brianna became his caretaker and advocate while holding a fulltime job and mining her computer at night for help. On Facebook, she found the VA Caregiver Support Program for Post 9-11 Veterans, designed to help disabled veterans stay in their homes and provide support for family members who care for them. Its services range from monthly stipends to home modifications. The VA started taking applications last May, and so far, just 18 Connecticut caregivers are participating, said Bonnie Cecarelli, caregiver support coordinator. She said the response is consistent throughout New England and predicted it will grow as more veterans return home. The U.S. Department of Veteran Affairs estimated that nationally, 3,596 veterans will qualify during the program’s first year, costing about $69.04 million. Brianna’s dedication to Andrew is typical of the program’s participants, said Cecarelli who works at the West Haven VA Hospital. “These girls are amazing and they’re young,” she said, adding “the vets come back and they’re different. They stay with them, the poor girls, and their lives are changed.” Brianna and Andrew were only married for eight weeks before he left for Afghanistan. The program was established after a study showed that disabled veterans fare better at home than in institutions, Cecarelli said. To be eligible, a veteran must have served after Sept. 11, 2001, have physical or mental injuries from military service, and have an unpaid family or friend caregiver. A nurse visits the home to assess the veteran’s needs and the caregiver is required to complete a training program, either online or at classes. Among benefits are: monthly stipends that range from $500 to $2,600; travel and per diem payments when veterans have medical appointments; health insurance for caregivers who don’t have it; respite care; medical equipment; airplane travel to visit friends and relatives or for them to visit; peer mentoring among caregivers; and a direct link to the VA through the caregiver coordinator, who is required to return their calls within a day. Jennifer and Jonah Hughes, of Hartford, probably would have lost their house without their monthly stipend of $1,900 from the program, Jennifer said. “It’s just been amazing for us that we have this program,” she said. Jonah, an Army veteran, suffered brain damage, physical injuries and PTSD from a roadside bomb attack in Iraq. He was discharged last year and still hasn’t received any of the VA disability payments that he has applied for and that they were counting on. Jennifer cares for him and their three children, ages 7, 3 and 2. She home schools the oldest, who is autistic. Her husband, 35, has about five doctors’ appointments a week, and the kids go along. For Brianna, the program’s link to Cecarelli is crucial. “I don’t know what I’d do without her,” she said, recalling how once she spent 3 ½ hours on hold for a VA help line. With Cecarelli, she said, she has “a family advocate, someone there who knows you.” The guarantee of getting a call back within a day is unusual for the VA, she said. One day, Brianna placed a frantic call to Cecarelli. 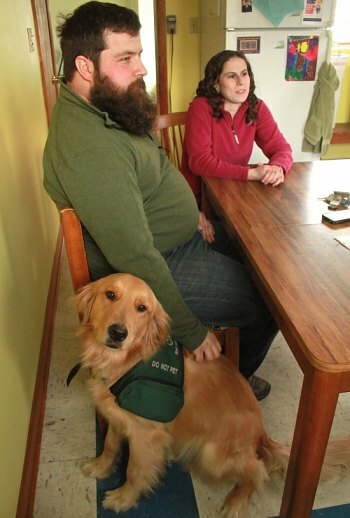 VA staff members weren’t allowing Andrew to bring his service dog, a Golden Retriever, Marco, into his doctor’s office. Cecarelli intervened and the trained dog, which calms Andrew, went with him. “The pet thing works. It puts me in a good mood,” said Andrew. “I can go to more crowded places than I used to, and not be so anxious,” he said, explaining that he focuses on the dog, not the people. “Wherever he goes, Marco goes,” said Brianna, who describes herself as “persistent” when it comes to getting help for her husband. Cecarelli is required to call the caregivers every 90 days. But, she encourages more contact, welcoming phone calls during office hours and visits when they’re at the VA for appointments. The new schedule still won’t work for Jennifer Hughes and Brianna Pavlak. Jennifer said she can’t leave her husband and children alone for much more than an hour. “It’s so overwhelming when you have someone who is injured, to even make dinner,” said Jennifer, 30. She said she hasn’t even had time to find a pediatrician since she moved to Hartford in February, 2011. Brianna, 29, works until 4:30 p.m. with toddlers at the Coast Guard day care center in New London and then heads home to be with Andrew. None of the veterans now in the program have jobs and caregivers often can’t leave them to work. “Many are struggling” financially, Cecarelli said. The stipends they receive are based on the hours a veteran needs supervision and partial pay rate of home health care aides. Most of the caregivers have no help, and little or no family support, Cecarelli said. But, they have resisted respite care offered in the program, saying the veteran “wouldn’t like it” or “we don’t want a stranger in the house,” she said. The Pavlaks have a friend, a Vietnam veteran, who takes Andrew to doctor’s appointments when Brianna has to work. On those days, she talks to the doctor by phone. She takes off from work to go to Andrew’s neurology appointments in West Haven. 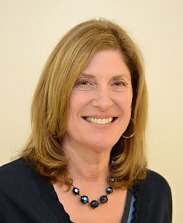 Cecarelli said some of the families moved to Connecticut to be far from relatives, who may not understand effects of PTSD, such as: outbursts of rage; anxiety around people; nightmares; flashbacks; the jitters from constantly being on the lookout for danger; and just the fact that the veterans are not their old selves. The Hughes family moved to Hartford from Germany after Jonah’s third Iraq deployment. Jennifer hails from California and Jonah, Florida. They don’t know anyone in Connecticut, Jennifer said, explaining that was a motivating reason for the choice. “To go back to family where people remember how you used to be, it’s easier to be here,” she said. The Pavlaks live near Andrew’s family. His brother is helping him fix up the two-family duplex the couple recently bought. But, Andrew’s relatives don’t always understand his postwar behavior, which can include depression, survivor guilt and hyper-focusing on news about war. For information on the caregiver program contact Cecarelli at 203-932-5711, ext. 2297 or go to the National Council For Aging Care.